'Football For A Buck' Tells The Story Of The USFL In All Its Doomed Glory For three years in the 1980s, sports fans could enjoy football in the Spring. Master storyteller Jeff Pearlman describes the league's wild games, wilder players, and owners — including Donald Trump. 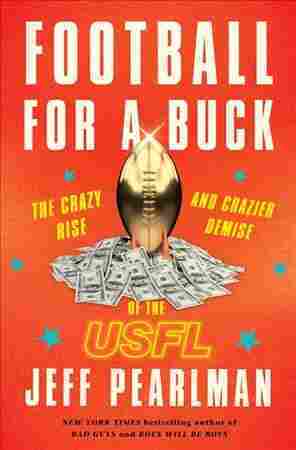 "The idea was a good one," Jeff Pearlman writes in his endlessly fascinating history of the league, Football for a Buck. "Wait. Hold on. Let's start again. ... The idea was a great one." But thanks in part to an egotistical New York real estate developer (you get three guesses), the league died in 1985. Football for a Buck tells the league's story in all its doomed glory. The USFL was the brainchild of a New Orleans art dealer named David Dixon, who came up with the idea in 1961; he resented that the NFL didn't want to add expansion teams. (They changed their minds a few years later, and Dixon's hometown ended up with its very own squad.) It took nearly two decades, but Dixon finally found wealthy businessmen willing to buy teams and bankroll the USFL. The league didn't have the most promising start. Team owners opened tryout camps, which ended up being "a buffet of the fat, the skinny, the minuscule, the enormous. With no experience requirements, there were plumbers and doctors and lawyers and lab technicians, taxi drivers, fish tank cleaners." That's not to say it was all misfits: In its brief existence, the USFL managed to draw future star players like Jim Kelly, Herschel Walker and Bobby Hebert. The expansion failed spectacularly and, later, the owner of the New Jersey Generals — a brash, young New York businessman named Donald J. Trump — bullied his fellow team owners into moving the USFL season from Spring to Fall, where it would compete directly with the NFL. The move was roundly mocked, and the USFL threw one last Hail Mary: an antitrust lawsuit against the NFL. The good news is that the USFL won. The bad news is that they were awarded exactly $3 in damages. With that, the league went from good-as-dead to dead-dead. American sports have seen their share of colorful minor leagues, but none quite as crazy as the USFL, which, as Pearlman writes, "enlisted your tired, your poor, your huddled masses, your one-armed and chain-smoking and half-blind and clinically insane." Happily, Pearlman proves to be the perfect person to write its history. He approaches the USFL with both the critical eye of a sportswriter and the unbridled enthusiasm of a fan. He's also quite funny. He describes the disastrous merger of two USFL teams as "sort of like watching two cousins French kiss — unnecessary and uncomfortable." And he uses humor (and a whole lot of anger) to describe Trump, whom he variously calls "a hot air balloon," a "carnival barker" and a "football moron." Above all, Pearlman is a master storyteller — he draws the reader in with his vivid descriptions of the league's wild games and wilder players. He's clearly done his homework, drawing from media coverage of the league and interviews with players, who look back on their USFL days with varying degrees of fondness. Football for a Buck is a hilarious, engrossing roller coaster of a book, and it features a lesson about greed that sports fans — and all Americans — keep learning over and over again these days: "Wealth and ego go hand in hand, and neither rests easily."